Wir sind beide in Frankfurt am Main geboren und aufgewachsen und leben seit Jahren berufsbedingt im Odenwald südlich von Darmstadt. In unserer Ehe verbindet uns unter anderem die Freude an der Musik, am Wandern, Kanu fahren, und am „Bibel-Teilen“. Stephan: Ich arbeite als Pfarrer und Dekan (Superintendent) im Evangelischen Dekanat Odenwald. Mein Aufgabenfeld umfasst beispielsweise den Predigtdienst, die Begleitung der 25 Kirchengemeinden der Region, Konfirmandenunterricht, Ökumene, Seelsorge und die jährliche Jugendfreizeit. Zu Irland: Die Vielfalt und Buntheit der lutherischen Gemeinde, die ökumenische Weite und die hohe Eigenverantwortung zahlreicher engagierter Menschen faszinieren mich.
Larissa: ich habe unter anderem in Durham (GB) Politikwissenschaft, Geschichte und Öffentliches Recht studiert. Derzeit arbeite ich als Referentin für Gesellschaftliche Verantwortung im Evangelischen Dekanat Odenwald. 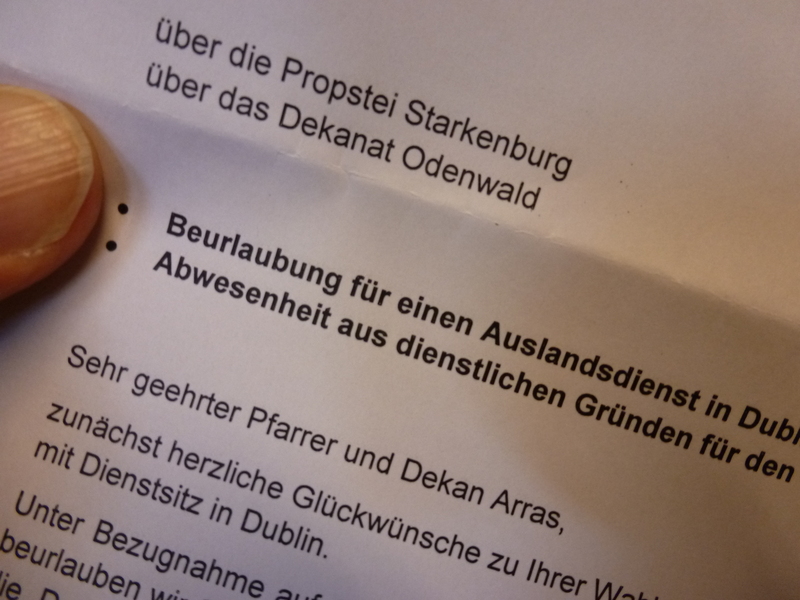 Zu Irland: Ich freue mich darauf, Teil der Gemeinde in Dublin zu sein. Gespannt schaue ich auf mögliche neue berufliche Perspektiven. Jetzt gibt es für uns eine biografische Brücke nach Irland! Wir stehen noch am anderen Ufer und schauen neugierig zu Ihnen hinüber und grüßen Sie herzlich! these are my first words to all of you after the church council elected me as your new pastor! Even though it is a long time until 1st September, many thoughts are going to Ireland and we begin to understand: there is a lot of saying farewell ahead of us in Germany and a new world waiting for us in Ireland. But endings and beginnings belong to our lives and they make it colourful. Whatever we end and begin, it lays in God’s hand. Who are the new pastor and his wife? We were both born and grew up in Frankfurt/Main. Our home is in the Odenwald, a rural area with small towns and villages and many forests, located between Darmstadt and Heidelberg. Together we like to travel (hiking, canoeing), we enjoy music (singing in a choir, piano playing, church organ…) and we daily share God’s word reading the Bible. Supporting my colleague pastors and the parishes, representing the parishes and different church offices in ecumenical affairs and in the local civil contexts, preaching almost every Sunday, being involved in counselling. A special joy and enrichment for me has always been the youth camp every summer. Most of the times it took place in Sweden. I am looking forward to seeing you! The colourful parish with the German and the English-speaking branch, with an open ecumenical mind fascinates me. So many people are involved in the parish’s life, which is wonderful. Many of you are living in one of the smaller towns in Ireland and I will be happy to meet you there. Larissa: I studied Political Science, History and Public Law in Freiburg (Germany) and Durham (GB). Since a couple of years I’m working for the deanery and it’s parishes in the field of Corporate Social Responsibility. One topic is, for example, the use of renewable energy in the context of the integrity of creation. 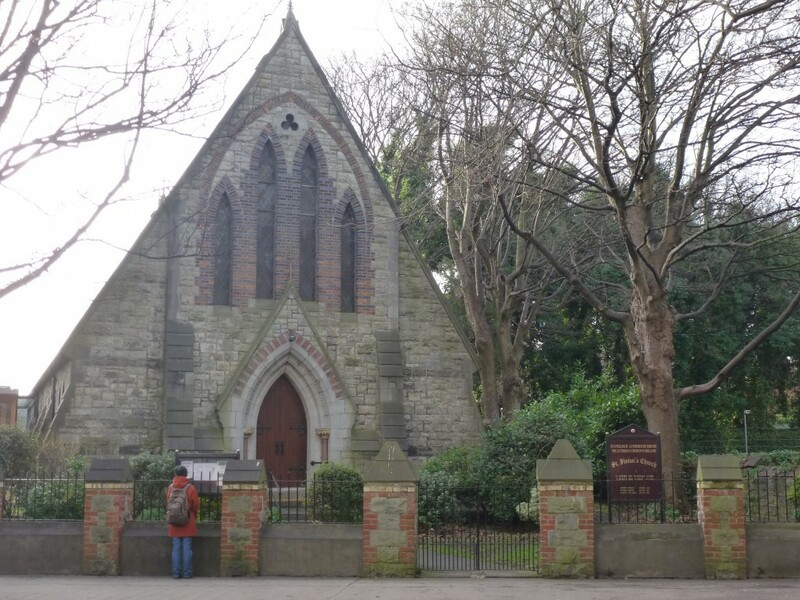 I am looking forward to being a part of the parish in Dublin and to discover new job perspectives in Dublin. There is now a bridge for us between Germany and Ireland. We are still standing on the other side, looking curiously to our future place. We are grateful that the church council entrusts us with the assignment and welcomes us both. Thank you very much for all feedback during “our weekend” at the end of January! Das schrieb mir ein guter Freund: “Patrick ist ja wirklich ein ökumenischer Heiliger, denn er ist nie heiliggesprochen worden, die Iren haben einfach heilig gemacht. Deshalb ist bis heute am St. Patricks Day das Motto: “Patrick was a saint… we ain’t”. A good friend of mine wrote: “Patrick is really a ecumenical Saint, because he never was canonized by the church. The People of Ireland made him to a Saint. So they say at St. Patrick’s Day: “Patrick was a saint… we ain’t”.